Today’s disruptive times make growth seem elusive. How can you find the resources, time, and expertise to accelerate your organization’s growth? After close to two decades advising the world’s biggest companies on growth, Innosight is creating solutions that help organizations of every size own their future. We’re excited to introduce the first of these solutions, Innosight X. Sign up for Innosight X- Growth Strategy product updates or to be part of a pilot program. Innosight X empowers organizations to define their growth goals and create strategies to achieve them through an online platform that combines industry-leading tools, Innosight’s growth expertise, and a community of peers. Premium subscribers will also be able to work with accredited experts in a self-paced manner through a series of Growth Sprints. What is a Growth Sprint? 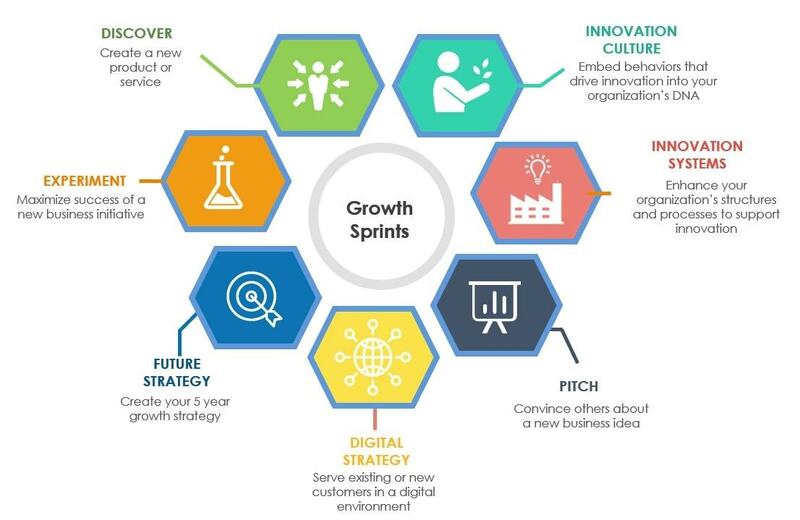 Growth Sprints are a set of defined activities that follow best-in-class methodologies to tackle a specific growth challenge and deliver a tangible outcome. Guided Growth Sprints: Leverage established processes involving best-in-class IP & methodologies, designed to help you achieve your growth goals within a specified time horizon. Experienced Growth Experts: Learn from a network of carefully selected advisors through one-on-one virtual sessions, where they will guide you through the process, review your strategy, and provide an unbiased assessment of new initiatives. Our experts have an outstanding track record, with some having over 30 years of experience advising business leaders and building new ventures. Online Training & Tools: Access a blended learning platform containing detailed training sessions, case studies, progress trackers, as well as practical tools and templates that can be applied immediately to your growth challenge. Community of Peers: Join a community of like-minded strategists and innovators – learn, be inspired, and give back as you spur each other towards new growth goals. To find out more about how you can accelerate your organization’s growth efforts, or to inquire about participating in a pilot of Innosight X, contact us here.